It’s Saturday! Screw the pleasantries, let’s get right into our progress for the Sims 3 Family Man Challenge. When we left my Sim last week, he was the proud father of 21 children. This week, Sharla Bills gave birth to twins right off the bat, bringing our total up to 23. Ayesha Ansari (my darling, darling Ayesha) gave birth to her and my Sim’s seventh and final baby, a beautiful boy, making that 24. Oh, how I wish more than eight people can reside in a household, but I suppose the game is challenging enough as it is. 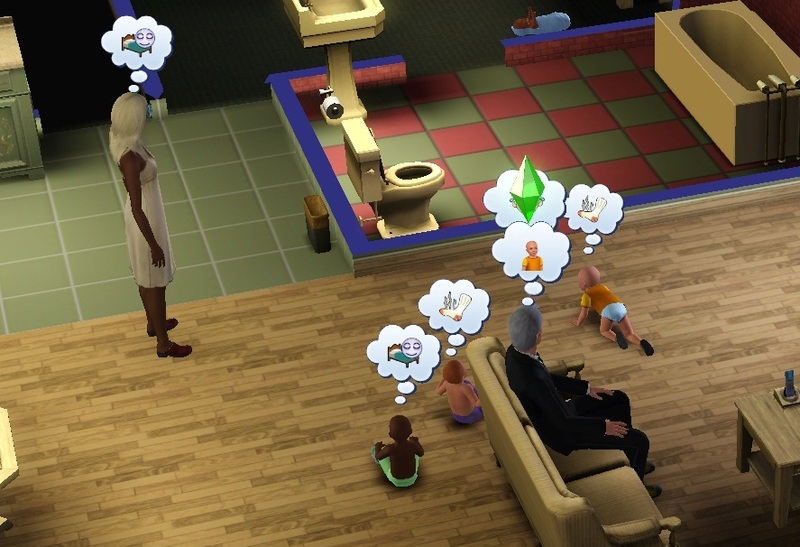 I can’t imagine how much harder it would be to keep track of any more Sims than that, to make sure they all eat and sleep and go to the bathroom in time before messing themselves. Meeting Monika Morris. Alliteration is fun. Monika Morris also gave birth to twins — 26. I don’t believe we’ve met Monika on this blog yet, but she was a spirited young woman I met at a remote beach one day. I have taken to visiting community lots that are more out of the way; less chance of getting caught cheating by any of my dozen or so girlfriends this way! Bebe Hart gave birth to twins. 28! Agnes Crumplebottom — my “official fiancee”, I guess you can say — gave birth to twins. 30! Madison VanWatson gave birth to twins. 32! Jess Eastman gave birth to twins. 34! See, now the multiples are starting to roll in; that’s what I’m talking about. By now, three days have passed (the gestation period of a Sim, I believe) and we’re now back to Sharla, who got pregnant again after her twins and ended up giving birth to a baby boy, making that 35. By the way, I feel obligated to remind everyone that we are now two babies shy of my last record of 37, from when I did this challenge way back in the day. But here, something strange happened. The game suddenly informed me that the Hart family has decided to move to another town. Wait, WHAT?! Bebe! Our kids! Bebe et mes bébés! Seriously, I didn’t know this was possible. Is it a way for the game to regulate my neighborhood population? Is the town getting a little too full with my Sim’s children? I sure hope not, because I’m nowhere near done. The last time I saw Bebe Hart, *sniff*. Thankfully, Bebe’s and my Sim’s children remained in the family tree so they still count in the record. Unfortunately, I’ll just never see them again. That’s quite a depressing thought, actually. Regardless, Bebe Hart’s departure was a pretty big setback, along with Ayesha’s household being too full now for her to become pregnant again. Two Sims I cannot romance anymore! Once again, I had to go out and meet some new people. Enter three women my Sim met at the local library: Toya Reid, Juliet Stump, and Tracy Connor. I met them all on there on a single trip and congratulated myself on a successful outing. It wasn’t until later when I opened up neighborhood map that I discovered all three of them lived in the same house, right across the street from me. ARGH! I told myself I wasn’t going to date roommates anymore! It’s a damn good thing that Sims apparently don’t talk about their relationships at home, because they’d certainly realize they were all dating the same guy…because in a few days, the size of the Reid/Stump/Connor household is going to double with the addition of my babies. Toya with her healthy green “glow”. That was my first date with Toya Reid when she came over to woohoo. Um, apparently those fumes wafting off her body is supposed to be her bad BO. Luckily, my Sim didn’t seem to mind. I mean, considering that it was HIS fault she smelled bad in the first place, since it appears she neglected to take a shower after he talked to her so much at the library yesterday that her bladder exploded and she peed herself amongst the books. Something momentous also happened — my Sim had a birthday! He is now an elder, which means there will be no more life stages after this. Still, I’m very sure I’m going to break my record of 37; now it’s just a matter of how much we can break it by before my Sim arrives at the end of his life and is visited by the Grim Reaper because he’s not gonna stop adding to the family ’til his ticker stops tickin’. Now that’s dedication. He’s still looking quite dapper, though, isn’t he? Er, except for the default clothes. Dear lord, we’re going to find a better outfit. Back to my regular suit I go. 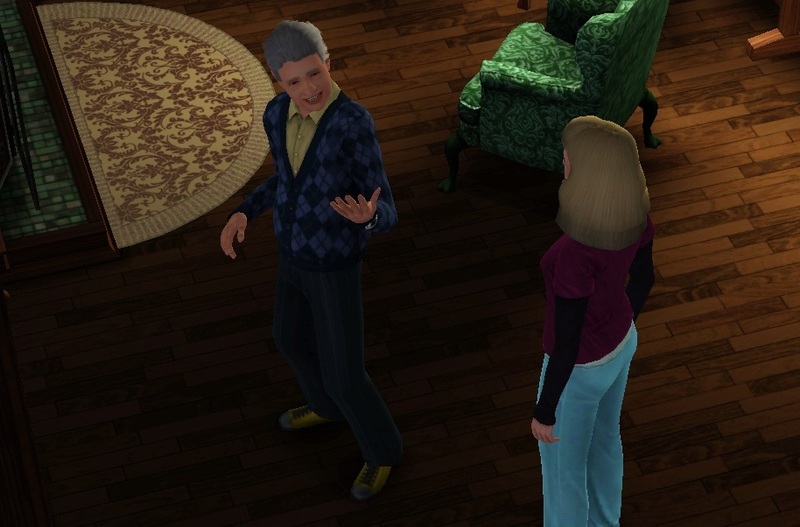 Sims 3 has awful taste in senior citizens’ fashion. Toya ended up having twins. We’re up to 37 and tied for the record! We’re going to beat it real soon though, because her roommies should be about to give birth too. Indeed, Tracy gave birth to a baby boy for the tie breaker. 38! Juliet gave birth to a girl, making it 39. Didn’t I warn you that the Reid/Stump/Connor household was going to be exploding with my babies? Time to split them up. Thus, I moved Toya and Juliet out into their own households. At just shy of 40 children, I think it’s high time I started visiting some of my offspring. Haven’t you ever heard of a crib? First, I hit up the Crumplebottom household. As you can see, Agnes had our youngest infant daughter swaddled and lying on the floor when I got there. Oh you, Agnes! 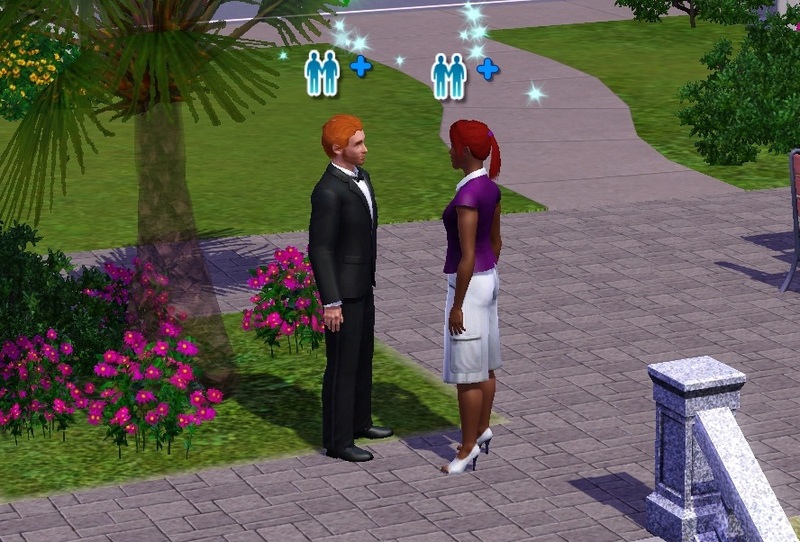 By the way, she has been my fiancee for weeks now, which I guess for a Sim is like, half a lifetime. I feel kinda bad that I haven’t married her after all this time, and it’s probably never going to happen now. After reading her Sims wiki page, this made me feel even worse. Haven’t you ever wondered why she’s always wearing black? Well, now I know, and it breaks my heart. I should never have read that site, but it does amaze and amuse me that all these well-known Sims NPCs have their individual back stories. Some developer spent a lot of time and effort writing all of these. Next, I visited Jess Eastman’s house, which just happened to be right across the street from the Crumplebottom house. It didn’t go well. Jess must have caught me walking across the street right after visiting Agnes, because she gave me a huge scolding for being a cheating scumbag as soon as I stepped up to the door. She got so mad she even put our newborn baby on the wet grass to shout at me more effectively. Poor sleep-deprived Sharla. I totally understand how you feel. Sharla Bill’s house is next. All I have to say is, she seems overworked. Time for another wave of new babies! Monika Morris, who was pregnant again after her twins, gave birth to a boy, bringing us up to an even 40. Agnes also gave birth to twins, making that 42 little ones. 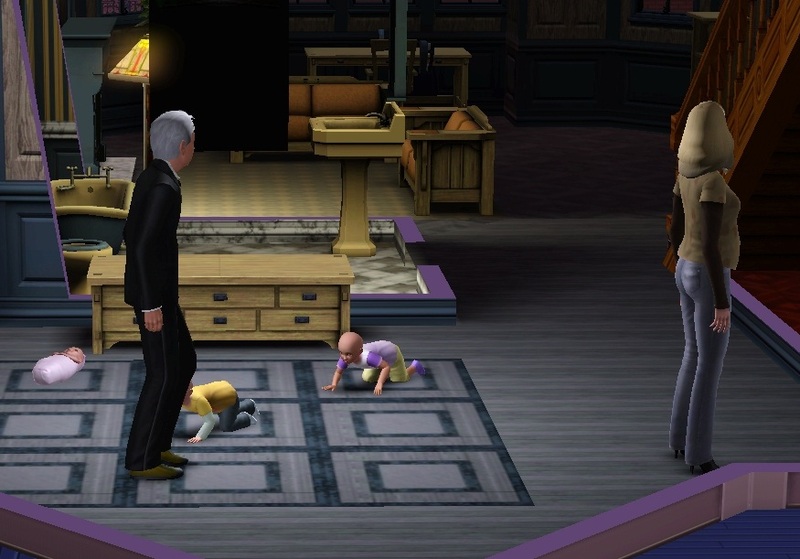 And with this latest set of twins, that makes eight Sims for the Crumplebottom household. Now I can never marry Agnes. Like, I literally can’t. The “have a wedding” option was conspicuously greyed out when I talked to her afterward, because there is no more room for the two of us and our seven children to live together. So sad. Madison gave birth to a boy — 43. Jess also gave birth to a boy — 44. 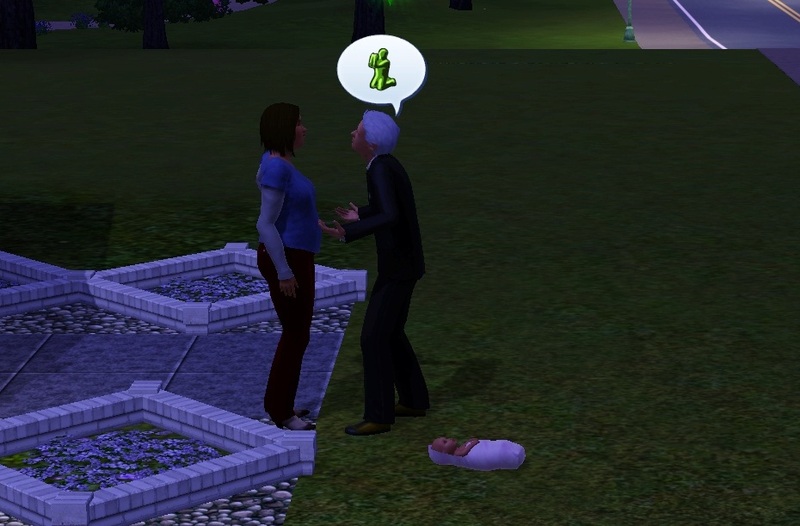 I tried for another baby with her right afterward, but she was still too angry at me from our fight outside on her lawn. I will have to romance her again when she forgives me. As if Sharla wasn’t stressed enough, she gave birth to another set of twins — 46. Toya gave birth to a boy — 47. Monika gave birth to twins — 49. Tracy gave birth to a boy — 50! Okay, I think that’s enough for this week. Aaaand I’ll just leave you with these screenshots of my family tree at this point (it’s so long I had to split it up into two parts). Next time Steam has a sale maybe. I know a few people who picked up this game this summer during the last sale. It’s definitely worth it, this game has been around for so long and it’s still so very enjoyable. Ah Saturday Sims! You do not disappoint. Top marks for bagging the bevvy of nerdy girls in the library! Hot-beds of lust and passion, libraries are. Perhaps if that’s where they all hang out you can entice one of them away and back to their house while the others are reading, or if I know Sims, playing extremely noisy computer games on the library PCs. It’s also very lucky your Sim isn’t fussy about the BO, I think there’s actually a Trait that makes Sims very particular about cleanliness, and they get very upset about smelly Sims and Pets. Incidentally, your Sim definately needs a dog. Dogs are babe-magnets. Whilst I understand that you’re working your harem hard, I don’t think this is an excuse for them to put babies on the lawn. Although as you say, judging by the Sharla screenie, you have burdened them something terrible. I love it that Sharla and her babies are either knackered or smelly, whilst your Sims is basically thinking ‘Oh look, babies.’ Yes, Mr Shitbag, lots of bloody babies! Sim thought-bubble comedy at it’s finest. And to put the delicious icing on the cake, your Sim has transformed into Bill Clinton!! How apt! Anyway, thank you so much for yet another first class episode and for making me laugh lots and lots. This has been an interesting series of posts, has me wanting to install and play the sims again. I’m just curious if you play with any mods for Sims 3, and if so which ones? No, I don’t use mods…in fact, I’ve been pretty clueless about the game since I haven’t played it in months and just started up again myself. I’ve heard there’s a lot of good stuff out there, though. Hooray! you manwhore! Gratz on your . . . um . . . achievement! Are you taking care of this offspring? LOL, I visit them, but in the game the Sims that are in my neighborhood (that I’m not playing as) are pretty self-sufficient. Good thing too, because I wouldn’t know how to take care of 7 babies in the household otherwise. The game AI takes care of it this way. I just have to comment to say that, even days later, that quote still makes me crack up every time I think of it. Your articles are awesome.